This picture is for my friend Anne (note to Anne: I was going to say pal). She’s looking for rain boots and I told her that I saw a sign for “All Weather” boots for $35 at Marc Jacobs. It’s something of a miracle that you can get anything for $35 at a Marc Jacobs store, but here they are. Pretty colors. 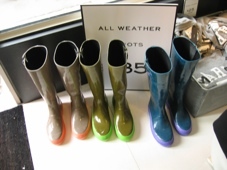 And the foot shape looks less clunky than other rain boots I’ve seen. Fashion is so much work. I cope by ignoring it and wearing mostly jeans and tshirts, but I was walking around yesterday, checking out a few stores on Fifth Avenue, and good God there’s a lot of cute clothes out there, people. I want them.